The former Yugoslavia is made up of 5 separate countries: Serbia and Montenegro, Macedonia, Bosnia-Herzegovina, Slovenia, and Croatia. The history of these regions is similar because Jewish communities, before the Holocaust, were prevalent throughout Yugoslavia. There is evidence of a Jewish population in the area of the former Yugoslavia that dates back to the Roman Period. Most documentation, however, suggests that Jews were not prevalent in the former Yugoslavia until the 10th century C.E. 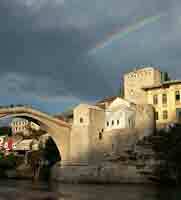 The former Yugoslavia was liberated in 1944. After the war, the region became known as the Democratic Federal Yugoslavia. Throughout the entire region, only 14,000 Jews returned. The Jews wasted no time, and the Federation of Jewish Communities was quickly opened. Many of the Jewish communities throughout Yugoslavia were reclaimed. The Zionist attitude of the Yugoslav Jews was also reestablished and, in 1948, the Federation of Jewish Communities gained the right to begin emigration to Israel. Eight thousand Yugoslav Jews moved to Israel in 1952. With the immigration to Israel, the population of Jews in Yugoslavia continued to decrease. By April of 1963, the government turned over again, and the area became known as the Socialist Federal Republic of Yugoslavia. The Jewish community that remained in Yugoslavia was especially concerned with Jewish cemeteries and the building of memorials in honor of victims of the war. As is true of many postwar Jewish communities, the religiosity of Yugoslav Jews diminished upon their return from the camps. There were no religious services after the Holocaust, and after 1968, the community had no rabbi. In place of traditional services and holidays, the Jews of Yugoslavia took to commemorating special days in honor of their family members who died in the war. Currently, only 5,500 Jews live in the former Yugoslavia. While it is a small population, the Yugoslav Jews are fairly well integrated within the international Jewish community. While many Jews have left the area of the former Yugoslavia, their monuments and synagogues remain. One synagogue is particularly well-known both for its beauty and for its present state of devastation. The Subotica Synagogue is located in the city of Subotica (within the area of Serbia and Montenegro). The synagogue was built in 1902, and while its beauty remains, it is in need of major renovations. The synagogue is one of the last architectural structures built in the Secessionist style of the early 1900s. Yhe World Monuments Fund listed the Subotica Synagogue as one of the 100 most endangered memorial sites. Both the World Monuments Fund and the Jews of Serbia and Montenegro are attempting to restore the Subotica Synagogue and are asking for donations from the international community. In 1991, Yugoslavia's republics began their violent breakup. While the entire region was negatively affected by the breakup, Jews, in particular, were thrown into the middle of the situation. Anti-Semitism was not blatant during the 1990s, but rather, it was used as a way to win Jewish favor. Both the Croatians and the Serbs accused each other of anti-Semitism, hoping to bring Jews to their own side. By 1992, the countries of Macedonia, Croatia, Bosnia-Herzegovina, and Slovenia had broken from Yugoslavia. This caused another structural change in Yugoslavia, and in 1992, the region became known as the Federal Republic of Yugoslavia. Thousands of Yugoslav citizens, including many Jews, were forced to leave their homes because of the violence. The civil war in Yugoslavia destroyed many Jewish landmarks including famous synagogues and memorials to the Holocaust. Because of the continuing violence in the area, the American Jewish Joint Distribution Committee (JDC) coordinated evacuations to Israel. In 1992, almost all of the Jews in Sarajevo were flown to Israel. The breakup of the former Yugoslavia led to a breakup of the Yugoslav Jewish communities. Jewish towns in Serbia and Montenegro as well as Bosnia and Croatia became completely autonomous after 1992. There is no umbrella organization to The Jewish communities of Yugoslavia are no longer connected to each other.